Participants should be confident and comfortable skiing or riding on terrain identified. You may ski or ride on more advanced terrain – what is listed here will be the minimum. The theme for Children’s Academy changes annually. Keep up to date with the latest in children’s snowsports education. The Academy is staffed by some of the Eastern Division’s best children’s educators and strives to deliver the most up-to-date information on teaching kids. It’s also an absolute blast and a boost for any children’s instructor! Children’s Specialist 1 (CS1) is the entry-level children’s education course for PSIA and AASI, and it includes an evaluation component. 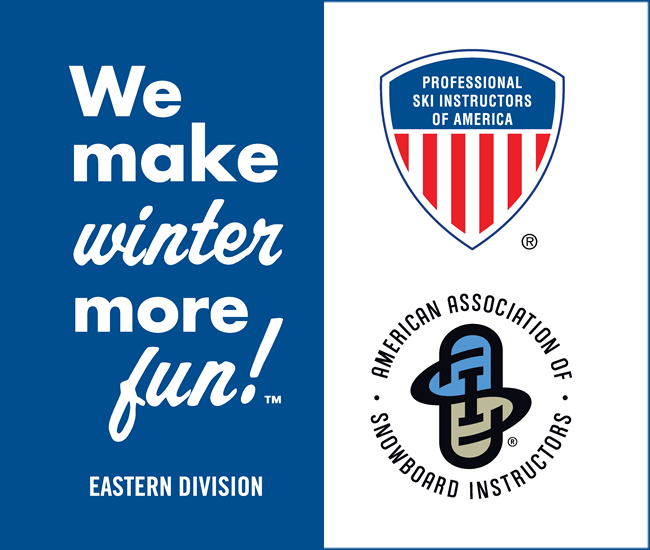 The course includes a written workbook; skiing/riding and teaching scenarios; and a technical discussion regarding how children/young students learn and progress from the Beginner/Novice to Intermediate Zones. Candidates must receive 80% or higher on workbook score given via online quiz. The required workbook takes a significant amount of time to complete, please plan accordingly. Children’s Specialist 2 will continue building on the instructor’s knowledge and skills from the Children’s Specialist 1. The course focuses on the specifics of child development for young learners as they progress through the Beginner/Novice to Advanced Zones. Participants will integrate their technical understanding of the CAP model with movement analysis and teaching activities for children in the Intermediate and Advanced Zones. Candidates must receive 80% or higher on workbook score given via online quiz. The required workbook takes a significant amount of time to complete, please plan accordingly. The Kids bumps event is packed with essential information for all levels of coaching. Through group discussion, and on snow exploration, participants will examine comparisons of movement patterns between age groups and learn age-specific drills and coaching methods. Training courses will be provided for practice and experimentation. Participants will understand how applying the CAP model will help them to be a more effective coach with any age group. Held in conjunction with the Race Program events this program will hone your skills as a kid’s race coach and develop your coaching eye. Learn the basics of race course set up and understand how athletic development stages play a key role in their ability to achieve success. Develop activities that improve the racing and all around skills of your kids in gates and free skiing/riding. At the same time your own racing skills may improve as well. This course is open to USSA Race Coaches at member price.